U.S. Sens. 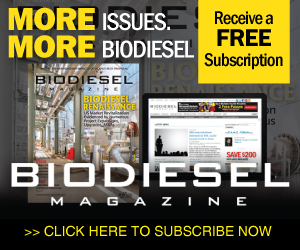 Chuck Grassley, R-Iowa, and Maria Cantwell, D-Washington, introduced a bipartisan bill to renew the $1-per-gallon biodiesel tax credit for three years and to reform it from a blenders incentive to a domestic producers tax credit. Renewable Energy Group secured financing of up to $20 million from First Midwest Bank for the $24 million capacity-expansion project at the company's Ralston, Iowa, biodiesel refinery. The expansion will more than double capacity from 12 to 30 MMgy. Christophe Len, full Professor at the Université de Technologie Compiègne – UTC (France), has won the 2017 Glycerine Innovation Award, sponsored by the American Cleaning Institute and National Biodiesel Board and presented at the AOCS annual meeting. After hosting an Earth Day community event to celebrate the first blooms in its Maui sunflower biofuel crop, Pacific Biodiesel delivered its combine harvester to the crop site to prepare for the first harvest, expected to begin in the next month. The NBB argued before the U.S. Court of Appeals for the District of Columbia Circuit April 24 regarding the Renewable Fuel Standard for 2014-'16. The NBB challenged the U.S. EPA's interpretation and use of its waiver authority under the RFS statute. Pittsburgh-based Optimus Technologies was awarded the 2017 Governor's Award for Environmental Excellence from Pennsylvania's DEP for its B100 conversion system, which was installed in 25 city vehicles to optimize performance and emissions reductions. The National Oilheat Research Alliance recently released the results of a survey from 139 respondents on the usage and potentials benefits and issues associated with the blending of traditional heating oil with renewable biodiesel for home heat use. UConn's accomplishments include eliminating the use of Styrofoam in its facilities, operating a comprehensive recycling program, recycling grease to result in biodiesel fuel, and saving water and energy by using high-efficiency sprayers. German biodiesel exports in 2016 increased by 4.8 percent over the previous year, to 1.56 million metric tons, according to German government data. This is up from the export tally originally announced in March, which was 1.54 million tons.